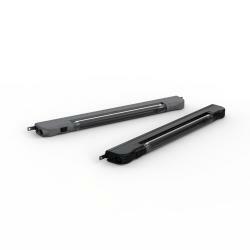 This energy efficient fluorescent enclosure light can be mounted in many different ways, as well as directly on 19" profiles, in any enclosure, and helps when maintenance is performed in the field. Lighting system with a compact design, suitable for all types of enclosures or racks. It has three possible fixing possibilities: magnetically, screw mounting with a variable distance between holes and/or snap-into 19” rack. It is an electronically operated device and has a service life of 10,000 h. The body of the lighting system is made of PC-ABS. An integrated connector allows the activation of the lamp by a door switch by using the TLCS product without performing any additional wiring. It is provided with a protection cap made of PC and the colour of the light is cold white. -15 ºC to +45 ºC. 448 x 54.5 x 26 mm. 2x0.75 mm² open end cable (1.5 m long), 2x0.75 mm² female mini-connector for door switch use. 1 light with fix mounted connection cable, integrated magnets and mounting screws. Energy saving compact fluorescent enclosure light, with multiple mounting methods. Available with different voltages and frequencies. Off the shelf enclosure light, can be installed into enclosures that are located within different countries. The light can be easily mounted onto the enclosure's surface by either magnets, screwed directly onto the enclosures or profiles hole pattern, or clicked into 19" profiles. The enclosure light provides customers with a flexible solution as it can be mounted to any metallic surface or directly to 19" profiles. The light ensures both, operation and maintenance procedures can be performed safely, in the field. Highly recommended to install the door switch, TLCS, to improve the enclosure's energy consumption.